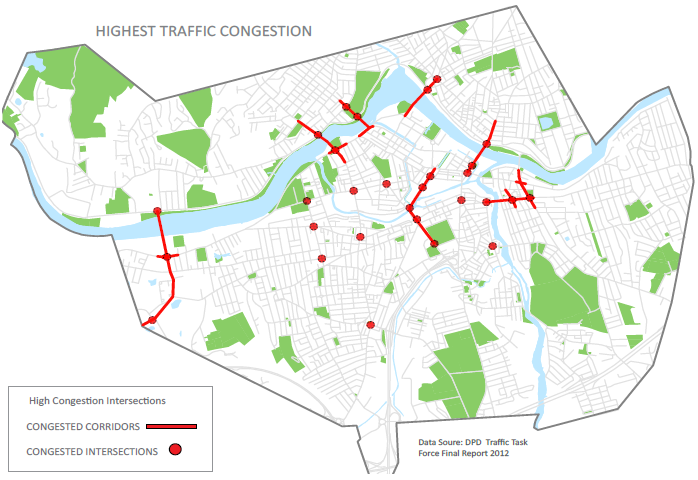 I’ve often heard that Lowell’s Acre neighborhood has experienced an incredible revitalization in the last decade. By many accounts, the relatively safe, clean, and strong neighborhood I’m familiar with was very different only a few years ago. Describing the Acre of 10 years ago in a story about Moody Street’s transformation, CBA’s website mentions “vacant buildings falling into disrepair and families moving out.” Although University Crossing, the new Jeanne D’Arc office, and several CBA housing projects are among the most visible aspects of the revitalization, there is a concurrent, smaller-scale effort that looks as if it’s paying just as many dividends: projects led by the Acre Coalition to Improve Our Neighborhood (ACTION). 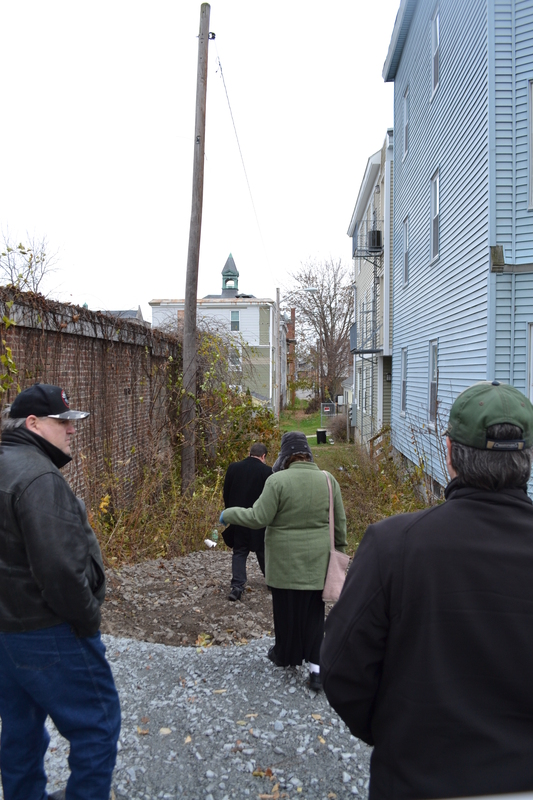 Dave Ouellette, president of ACTION, took members of the community on a tour of a few of these projects in November. 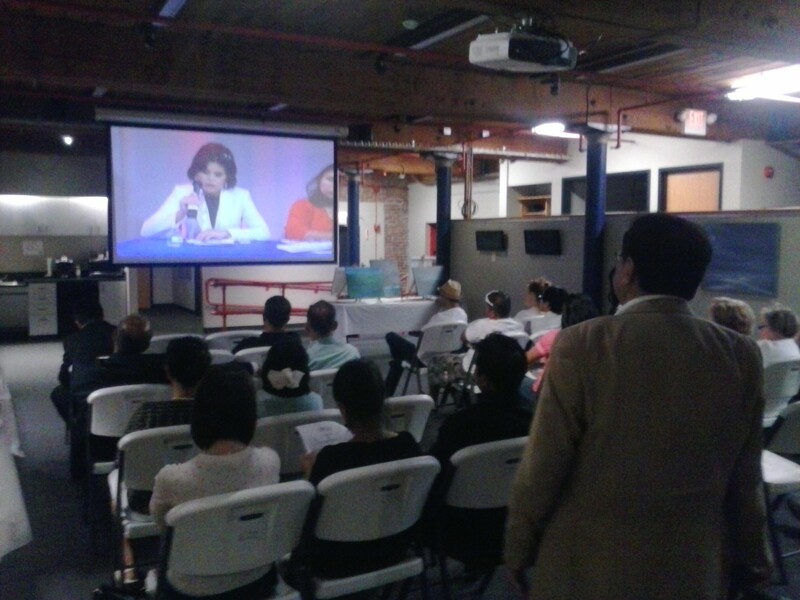 The tour was publicized by Do-It-Yourself Lowell, a citizen-led initiative to facilitate similar projects and events throughout Lowell. I found Mr. Ouellette’s story instructional and inspiring, as the projects tie sound planning principles with a community focus in a way that has helped redefine a neighborhood. 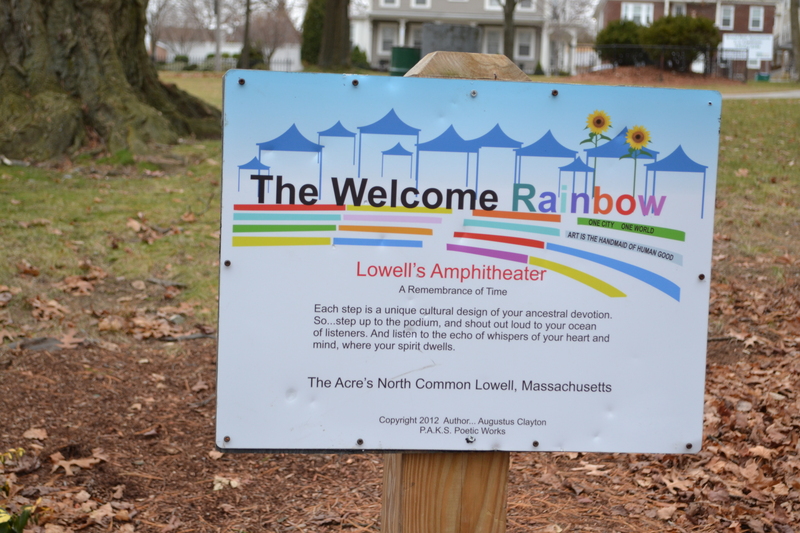 We started our tour with the North Common Amphitheater, also known as the “Welcome Rainbow.” The origin of the Amphitheater and ACTION are tied together. 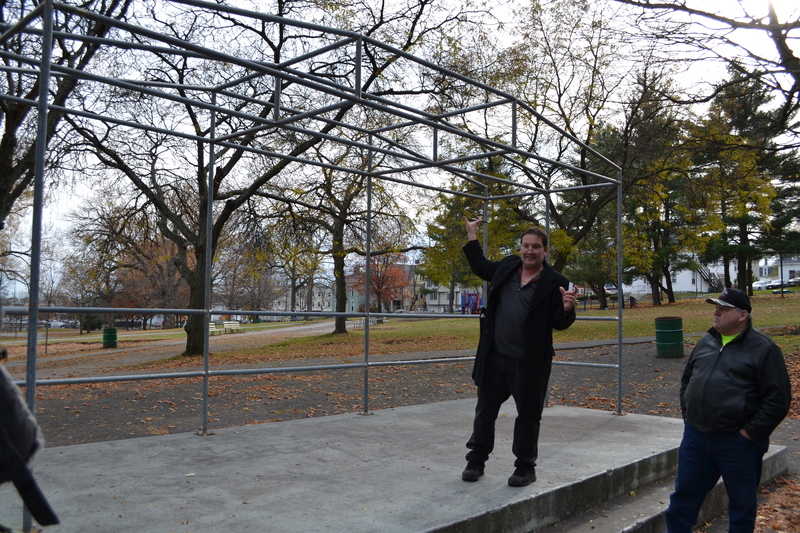 Mr. Ouellette gave a sneak preview of the newest addition to the Amphitheater. Letters will be installed on the metal frame spelling “ACTION Theater”, which can support lights, backdrops, curtains, or a movie screen. The City will run power to the frame. 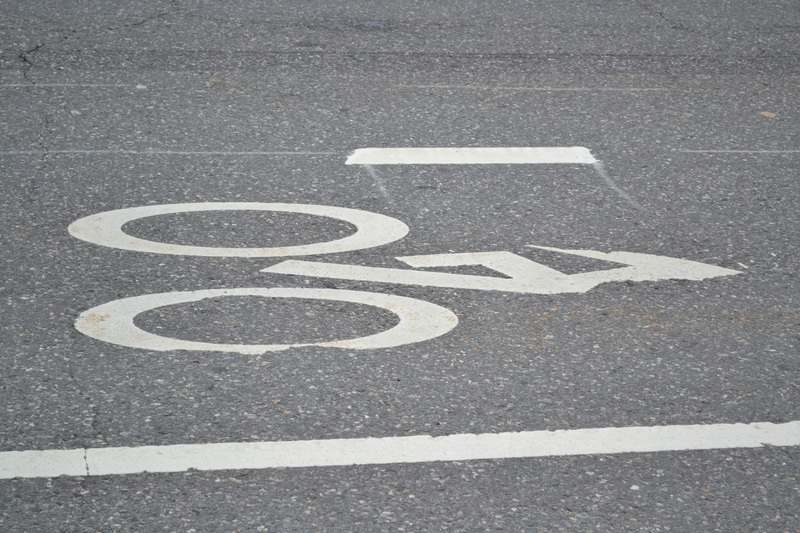 The Coalition for a Better Acre (CBA) had served as a neighborhood organization for the Acre since it had formed in 1982 to successfully oppose a plan to raze the Acre’s Triangle neighborhood. However, in a community meeting organized by the Lowell Police Department after a 2009 shooting, discussion about a resident-led neighborhood organization moved Mr. Ouellette to found ACTION to more directly speak on behalf of residents. In addition, ACTION understood that physical projects along with sustained outreach were needed to reduce crime and increase community. In 2010, CBA funded travel expenses for Mr. Ouellette and five others to attend the annual NeighborWorks America Community Leadership Institute, a three-day training session that includes a workshop in which teams create action plans for their communities. These plans, which had to “show substantial change,” were eligible for a $2,000 reimbursable grant from NeighborWorks. CBA’s team created a plan to improve the amphitheater. Mr. Ouellette told us that he grew up in the housing next to the North Common, and remembered that the 1970s-era amphitheater once hosted music and entertainment. It was a place to meet neighbors. However, by the late 2000s, lights around the amphitheater had been out of service for twelve years. Vegetation obscured it from the road, and gangs used it as a fighting arena. The team realized that it could be a benefit to the community once again. It was the start of a years-long project involving many groups and people. Suzanne Frechette, Deputy Director of CBA, and others assisted the group with an initial clean-up and power washing. In 2010, they asked the city to cut down the vegetation. In 2011, ACTION facilitated a partnership between the City and YouthBuild America to reconstruct the concrete steps: YouthBuild built the forms while the City mixed and poured concrete. In 2012, Western Avenue Studios, YouthBuild, and the Boys and Girls Club sponsored an invitation to the community to paint 26 mural spaces with “Welcome” in the many languages spoken in Lowell. The Cultural Organization of Lowell (COOL) provided paint, brushes, and other materials. Finally, the City restored the lighting, an $8,000 project in itself. Each step built upon one another. Each step proved the next step was possible. Most importantly, each step involved the sweat equity of the community the project would serve. In an unveiling celebration, Mr. Ouellette stood in front of the amphitheater, one empty mural space remaining, and asked, “What does this mean?” People shouted out answers until one came up with: “One City, One World!” The crowd cheered, and this became the phrase on the top step. The lot prior to park development. The tour then moved to the Wilfred Lavasseur park, which until 2012 was an empty lot. Although once children had played in the lot, it had since become a dumping ground and a hotspot for drug deals for more than a decade. 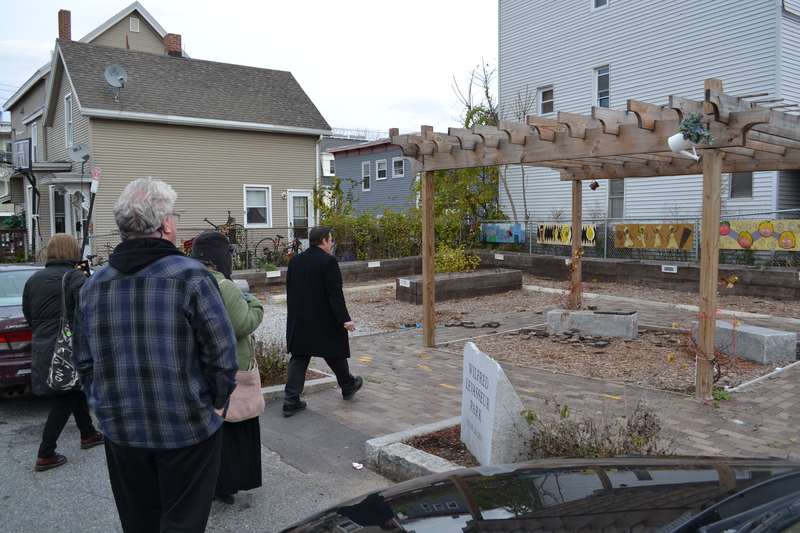 The City administration was impressed with ACTION’s leadership on the North Common project, and asked for help to transform the city-owned empty lot into a community space in 2011. Alleys between houses were often used by drug dealers to enter and exit the lot, so the group created a plan to fence the alleys off and create community gardens along the edges of the park. 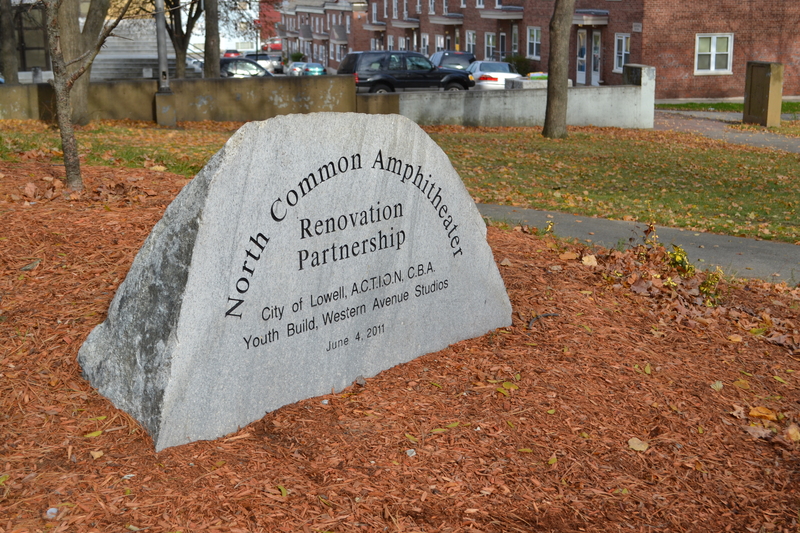 Along with grants from the City, Mass Service Alliance, Lowell Rotary, and NeighborWorks, Mr. Ouellette said ACTION “used the City as Lowes.” They recovered bricks from a renovation project near City Hall and intercepted the concrete barriers that would separate the center of the park from the gardening area. Most notably, when the Revolving Museum closed, it threw away many mural panels. ACTION and Mill City Grows came together to rescue dozens of pieces of art from the dumpster. These are now displayed on the fences of the garden and in other community garden locations across the city. More than 200 volunteers built the fifteen garden plots, shed, benches, and pergola over 18 months with the help from the city, CBA, Mill City Grows, Lowell Parks and Conservation Trust, UMass Lowell, and YouthBuild. 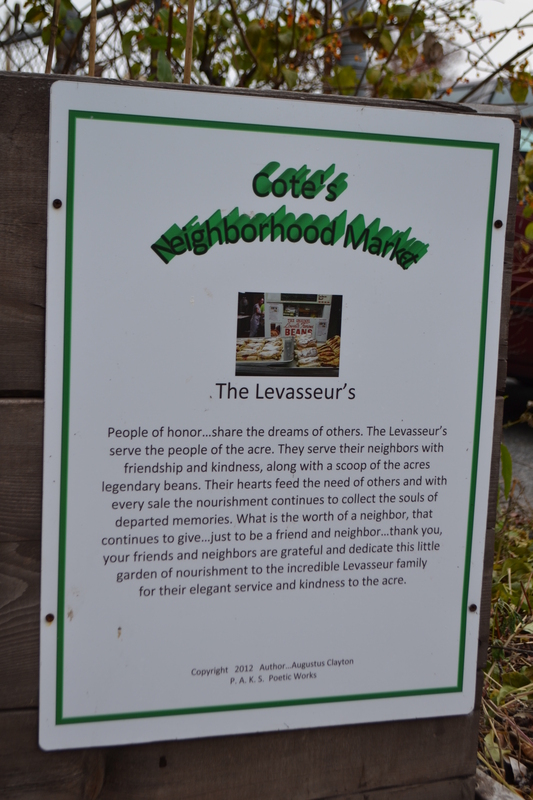 The tour group finds the park, named for the late owner of Cote’s Market, attractive even in winter. The space is now used actively by community members of diverse ethnicities and backgrounds, and they keep an eye on the once-derelict lot. The operations are overseen by community member Billy Heath, who attended the Garden Coordinator Institute, a seven-part workshop provided annually by Mill City Grows. The tour then turned to what may be ACTION’s next project, Decatur Alley. The old path runs between Merrimack and Salem streets, stretching from University Crossing to Decatur Street. Although Mr. Ouellette remembers walking the path as a child, it had since become overgrown and was used by drug dealers or others attempting to duck under fences to evade police. The tour traveled through Decatur Alley, cleared and just waiting for a project! Last year, ACTION and CBA organized and participated in volunteer crews to clear the alley of vegetation and trash. The crews included members of groups throughout the community, such as dozens of volunteers from Somebody Cares. 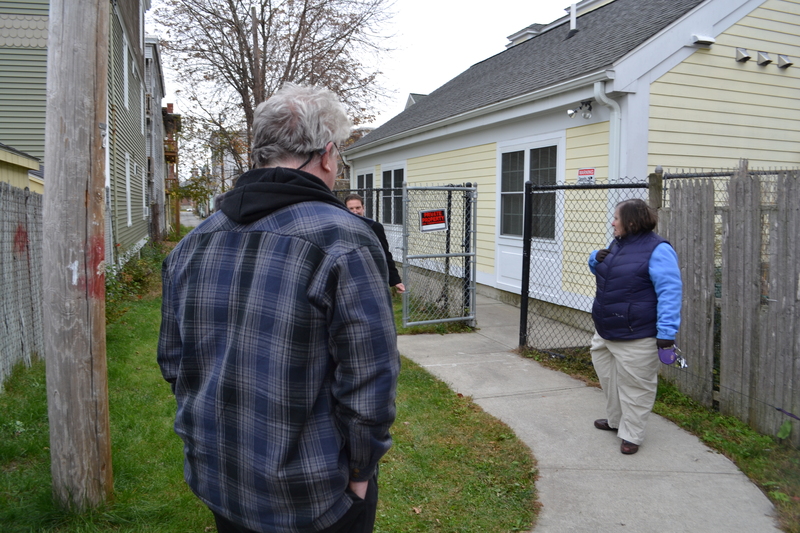 In a Sun story, Mr. Ouellette said, “We found 12 mattresses, six tires, air-conditioning units, needles, everything you could think of.” ACTION also reached out to the homeowners abutting the alley, including UMass Lowell. They convinced the University to not erect a fence that would shut off and reduce visibility on one end of the alley. The ultimate plan developed with the community is to transform the alley into a cobblestone walkway lined with benches, poetry pedestals, and artwork. ACTION plans to dedicate one area to veterans, which would engage yet another piece of the community. Another area would showcase artwork from local schools. An area behind Cote’s Market would become a spot for picnicking. The path could be used by students and residents alike. The path—and the tour—ended at St. Jeanne Baptiste church, a place so interesting it deserves its own post. Lowell House has provided a path behind its residences, providing an example of how the alley can become an attractive path. As we talked about what made the projects successful, Mr. Ouellette expressed his belief that more important than finding funding is making sure projects are a volunteer effort. He has seen several projects falter because they were built using a grant, but then had little to no community involvement in maintenance. If the community itself builds the project, they own it, and they take care of it. Trash used to be a problem at both the amphitheater and Lavasseur Park, but now community members take care of the area. He also stressed that anyone can be involved. Children helped pull weeds, young adults built structures, and older neighbors served drinks. The diversity of volunteers and partner organizations is inspiring. Once again, this all works toward ensuring mutual ownership of the projects. Finally, the projects must be useful, providing many functions for different audiences. The garden is a place to grow food and to relax. The amphitheater can be used for plays, movie screenings, and festivals (and hopscotch courts have been stenciled on to keep it useful between events). The more people using the project, the more people around to help keep it clean and safe. Ultimately, each project is individually useful and addresses a need, but as a group, they are transformative. 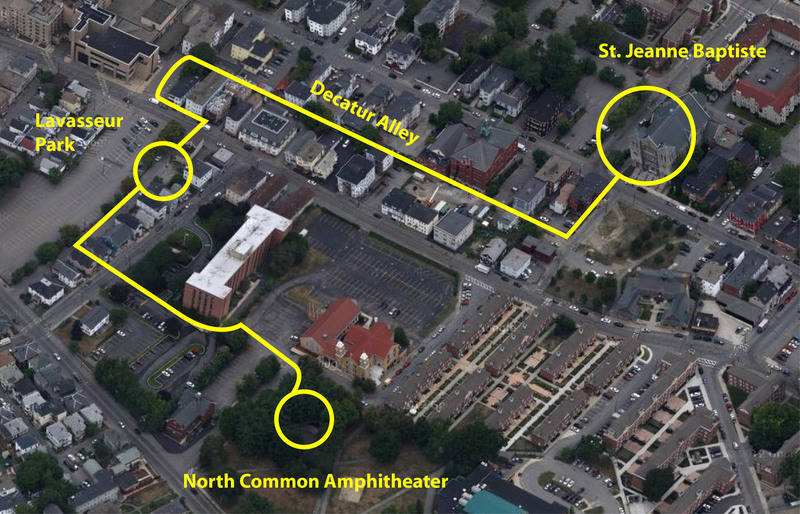 As I understand it, many small actions over years revived the amphitheater, created the community garden, and will create the Decatur Alley path. 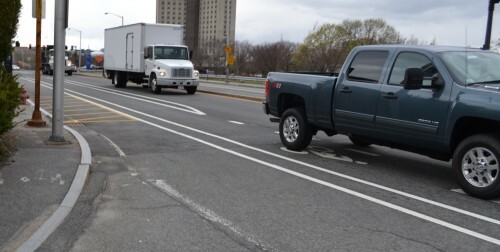 In turn, each of these is a relatively small project compared to a new University building. 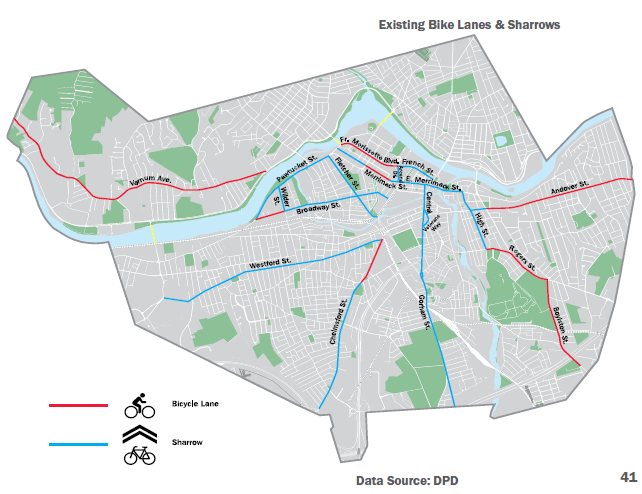 However, these small steps when put together—along with constant engagement—are majorly enhancing Acre residents’ quality of life. Small steps and partnerships can transform a park and a community. Local poet Augustus Clayton provided poetry for pedestals at both the Amphitheater and Levasseur Park. Earlier today Chris and I got to have lunch with an enthusiastic Lowellian working on an interesting project. 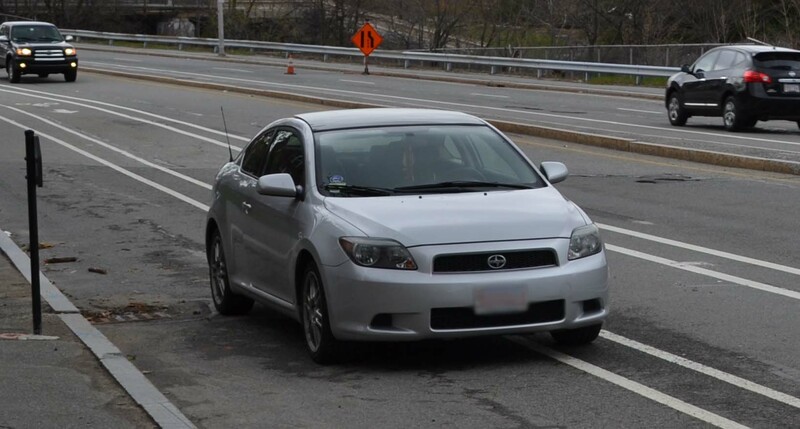 Joy Mosenfelder is working for Coalition For a Better Acre, and her pet project is the Merrimack Valley Time Exchange, a really cool idea that does a lot of neat things at once. In essence, a Time Exchange is a system where you trade an hour of effort or expertise on your part for an hour of someone else’s. It’s an exchange system where hours, not dollars, are the currency. So for instance, if you shovel an elderly person’s driveway for an hour, you can get an hour of having your car fixed, or a ride to work. Or learn glass blowing. The idea is that it helps people connect to get their needs met within their community, and additionally helps people to find ways to contribute. 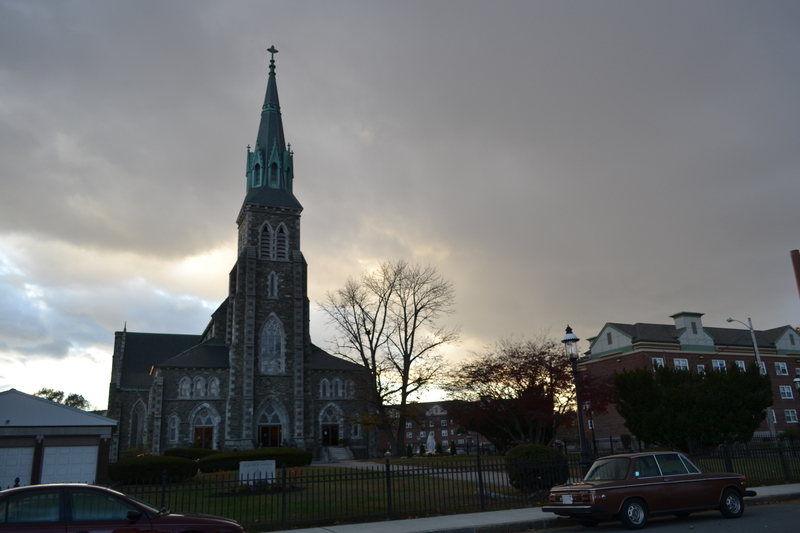 Joy was especially enthusiastic about the way that it can help build connections between people in the sometimes isolated segments of the Lowell community. If you’re interested in learning more about the project, there’s a great opportunity coming up. This Friday at 7pm you can come to Lowell Makes for an open house/potluck/music event. We’ll be there (as long as I catch the early train home from work, anyway), and I’m psyched to have a chance to learn more about both the Time Exchange and Lowell Makes in one fell swoop. We had a nice chat with Joy about how the exchange is going, and it was really interesting to learn more about both the practical and philosophical ideas that make it work. To my ear, a huge part of what it’s trying to do is build the kind of community that would have existed in ideal moments of human history (pre-agrarian hunter-gatherers or tight-knit small towns and neighborhoods, whichever you prefer) in which people help each other constantly, with the knowledge that everything they can contribute is balanced by something they get in return. Dense tangles of help and obligation. In our modern world, everyone seems to agree, it’s very easy to get disconnected from those webs of connection. The project is a way of codifying and giving structure to the exchange of help, a lattice to help the community plant grow. Joy told us that people have traded all sorts of things, from childcare to the rental of the 119 Gallery. She notes that the exchange could use more tradespeople, as positions like plumbers, carpenters, and HVAC are in high demand. On the other hand, if you feel like you’re not sure what you could contribute, don’t sweat it. Joy says a lot of people respond that way, and she firmly believes that everyone has something to offer. Even if you absolutely, positively have no special skills, people post looking for help with very basic tasks, or even for simple company. If you’d like to get an idea of what people trade, you can check out the board here. They currently have 87 members, ranging in age from 17-80’s, representing 10 different cities in the area. Around a quarter of the members are low income, and the area’s diversity of language and culture is represented. It really seems like a cool way to get connected with and contribute to the community, and I hope it continues to grow in its second year the way it has in its first. If you’d like to support the Time Exchange, they have a fundraiser going on over at Crowdtilt. Here’s their Facebook and their Twitter, and I hope to see some of you at the Friday event!